By 1965, the Motown influence reached its arms to both coasts. Not only were the sonic patterns of West Grand Boulevard influential on female soul records, as in the case of Ashford and Simpson in New York, certain songwriters vied for attention from the label. Notable on the West Coast were the Pipkin Brothers and Frank Wilson, who cut their teeth on some future (or current) Motown artists. 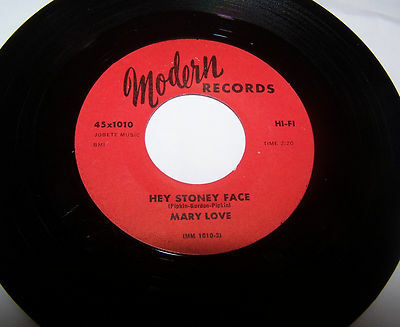 One of their joint pet projects for the Modern Record Label was Sacramento born Mary Love. Love found herself at 18 in Los Angeles recording material that could have passed muster for Supremes Album Tracks (if not better) with her slew of Northern Soul Future classics starting with “You Turned My Bitter Into Sweet” in the Spring of ’65. The Summer of 1965 saw her sophomore effort grow some teeth and determination. Both “I’ve Got To Get You Back” and “Hey Stoney Face” deserved A-side status. However, the perfect blend of West Coast “Wall of Sound” ethos that heralds the introduction of this track and then bears repeating later on sets it apart from the family of Motown knock offs that Mary would have.